Safety is, of course, a primary concern when selecting playground equipment, choosing a ground cover option and installing the play set, but you also want to make sure that your playground area fits with the overall look of your landscaping and will add to – not take away from – the overall visual appeal of your home. 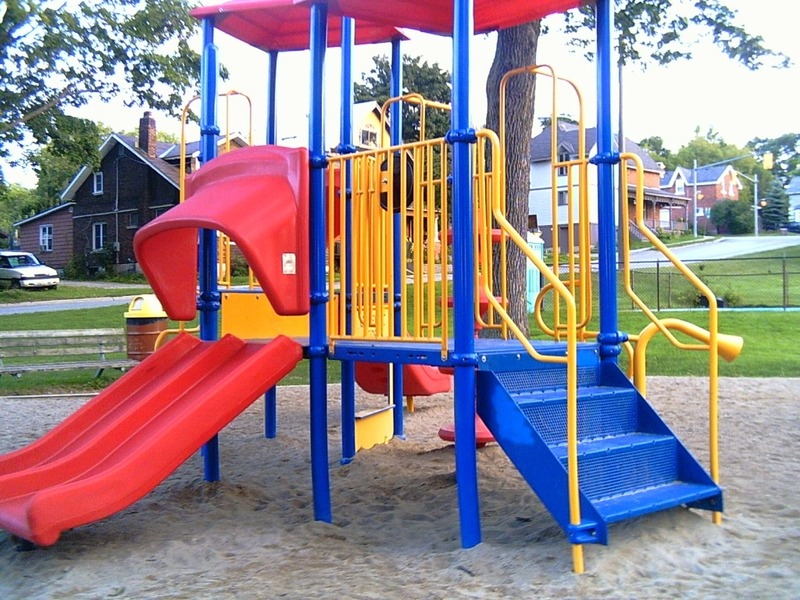 Most playground sets with swings, slides and other enticing features are made from plastic, metal or wood. Each of these has its pros and cons, but play sets made from any of these material options can be incorporated into your landscaping for a seamless transition from the play area to other functional areas of your yard or common area. This is particularly true if you choose groundcover options for playgrounds that visually complement other ground covers and landscaping features in the area. Since safety is one of the most important features of any children’s play area, this should be a consideration from the very beginning of the design process. 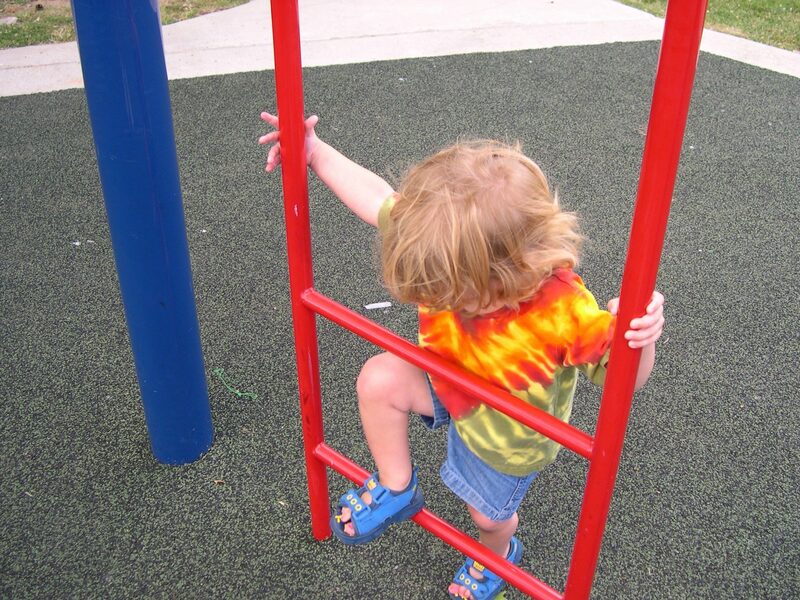 The area you choose for your playground should be a flat, level surface. If needed, hire a professional to grade the area for proper drainage and to ensure an even surface on which to install your play set. Look for potential hazards in the area, such as low-hanging branches or utility lines that may be too close to the equipment or the children playing on it. 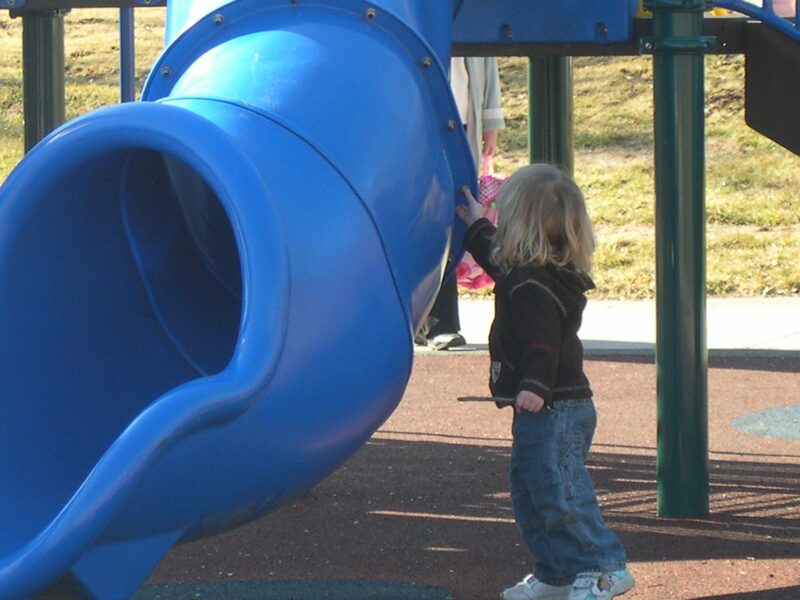 Exposure to the elements can shorten the life of your playground equipment or increase the need for maintenance. It can also pose a danger to children if metal equipment gets too hot from direct sunlight or swings are slippery from rain. Locating your playground under a canopy of trees provides natural shade and protection from the elements. Alternatively, you may want to consider installing a shade structure to provide protection from the sun. 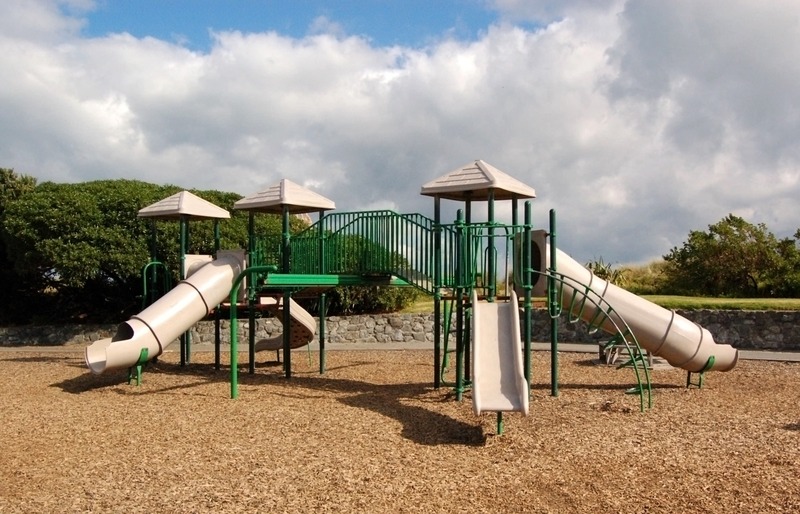 Make sure the play area surface is significantly larger than the actual play structure to make sure there is plenty of room for a safe landing after launching off of slides or jumping off of swings. You will also want to define the play space with a border in order to keep your ground cover where it belongs, provide a designated area for play and help to ensure that your children’s play area harmonizes with your overall landscape design. A paving stone walkway or patio makes a great border for a play area. Slip-resistant, skid-resistant pavers can help limit potential injuries while significantly enhancing the visual appeal of your yard or common area. If you already have a paving stone patio or pool deck, or plan to install one, this will also help integrate your playground area into the rest of your landscape and hardscape. Finally, you should place your play structure in an area that is easily observed by the adult or adults supervising the children. If your play set is located in a common area in a multi-family complex, you may want to add benches or other seating for parents watching their children play. You will also want to make sure that your play area is well lit and centrally located away from busy streets. If you are installing a play area in your backyard, make sure it is in a fenced area and that you can watch your child play from your kitchen window or patio. Ideally, the groundcover for your play structure will be safe, low maintenance, attractive and affordable. You may need to balance these by spending a bit more for a safer option or accepting the need for some maintenance to ensure visual appeal, but these are the four basic features most property owners look for in play area ground cover options. Here are some pros and cons of the most popular playground ground cover options to help you decide which one is best for you. Pea gravel is an affordable option that is often used for parking areas, dog runs and playgrounds. It provides a natural look at an attractive price and can help limit weed growth but does not provide a lot of protection for soft landings. It is a low-maintenance landscaping material, which may appeal to some property owners, but parents might not find the bumps and scrapes nearly as appealing. Additionally, the gravel may hide potential hazards, such as broken glass, and small pieces of gravel can become lodged in the tread of children’s shoes, which can lead to it being tracked into your home or scratching wood or laminate flooring. If should, of course, also be noted that gravel of any type can be a choking hazard. This may be of particular concern if small children will be using the play area. Overall, gravel ranks high for being inexpensive, attractive and easy to install; however, the safety concerns and potential damage to flooring mean that this one may not be the best choice for backyard playgrounds. Shredded rubber mulch is a newer player on the playground scene and is quickly growing in popularity, particularly for its ability to provide a nice cushion when children fall. This springy material also acts as a weed barrier and is a low-maintenance option for play areas, which increases its appeal for homeowners. It can, however, get dirty after long-term use, is more likely than some other options to escape your play area border and might get tracked into the house after children play outdoors. It should be noted that much of the rubber mulch available is made from recycled rubber, such as car and truck tires. While recycling this rubber and using it for other purposes is an eco-friendly choice, some recycled tire mulch may contain unwanted contaminants. Purchasing from a well-known, trusted rubber mulch company should help you avoid this; however, you may want to research the potential long-term effects of exposure to rubber before opting for this more expensive option. One more thing to be aware of is that new rubber chips may smell a bit when the temperature rises on hot summer days. Rubber playground mulch is a good choice for parents looking for a mostly low-maintenance option that provides a softer place to fall while playing. While you may need to spend a bit more time sweeping or raking to keep it in the playground area, you may find that it is worth it in exchange for a softer surface on which your children can play. Rubber mulch is generally more expensive than some other play area ground cover options, and there may be concern over long-term exposure to these small bits of rubber. Solid rubber playground surfaces are becoming a common sight in neighborhood parks and under schoolyard play structures. Rubber tiles and poured rubber surfaces are slip resistant, easy to maintain and available in a variety of thicknesses to meet varying needs. They also drain well, provide a level and even surface for playing, and are wheelchair and stroller accessible. This popular playground surface option is considered one of the safest, but it is also one of the most expensive, making it a bit too pricey to fit into many property owners’ budgets. However, if the price is not a problem, this one should be high on your list of considerations due to the level of safety it offers, the limited maintenance requirements and its visual appeal. There should be fewer potential health concerns related to rubber tiles or poured rubber as compared to rubber mulch, because it is not tiny particles that can be breathed in or swallowed, but you should still do your own research to make sure you are comfortable with this option. Using natural grass as a ground cover option provides a natural look that many homeowners prefer and is a popular choice for under backyard play structures, particularly since this often means simply placing the play set on an existing lawn. However, natural grass has several downfalls when considered for this use. Firstly, it is the highest-maintenance option out of all of the popular choices for playground ground covers. Because real grass must be mowed, weeded, fertilized and watered, it also has the highest ongoing maintenance costs. Grass is also prone to pests, bacterial buildup and uneven spots that can increase the risk for tripping and falling. It is slippery when wet, cannot be used after rain until it has had time to dry out, and creates a situation where mud and wet blades of grass will be tracked into your home if your children walk or play on it too soon after rain or irrigation. Homeowners or community managers considering the use of natural grass in a play area, should first read our blog post, “Is Artificial Grass Safer than Natural Grass for Outdoor Play Areas?”, which takes a more in-depth look at the pros and cons of both options. Finally, the water required to keep natural grass looking its best can damage your playground equipment by causing rust on metal play sets and causing wood play sets to rot. The amount of water required to keep a natural grass lawn green and lush can also be an issue in times of drought, which occurs often in areas like Southern California. This is one reason many homeowners are moving away from having natural grass at all and towards low-maintenance, drought-tolerant alternatives. Synthetic turf provides an even, level playing surface that drains well, never needs weeding or watering, provides the lush look of natural grass, and offers a softer cushion for rough play or awkward landings. The initial installation of artificial grass is more expensive than installing sod or planting grass seeds; however, this low-maintenance landscaping option can save you time and money far into the future when you compare its limited ongoing maintenance needs to the extensive maintenance required to keep natural grass green and healthy. Occasionally rinsing off and fluffing up the fibers is all that is needed to keep manufactured grass looking great, and spills or pet waste is easy to remove, should they occur. There is no concern over kids tracking wet grass or dirt into the house when they have been playing on artificial turf, and this type of ground cover will blend seamlessly with your overall landscape design. Fake grass is also accessible for wheelchairs and strollers, and it does not get slippery when wet like natural grass. One potential downfall of synthetic turf is that it will get hotter than natural grass when in direct sun on hot days. While it can become uncomfortably hot, the temperature drops immediately when the direct sun is removed or you spray it down with a hose. Of course, one of the pluses of choosing artificial grass is that you can save thousands of gallons of water, so you may not want to spray it down any more than you have to. Fortunately, there is an easy fix for this: To avoid the turf getting uncomfortably hot, you can install it under shade trees or you can add a canopy or shade sails to provide shade over the lawn. If the idea of permanent shade structures does not appeal to you, you can temporarily install a canopy over the area where your children will be playing that day. You can also help keep your synthetic turf lawn cooler by avoiding black crumb rubber and opting for infills that do not heat up as much in direct sunlight. In our opinion, it is best to choose artificial grass without crumb rubber infill if it is going to be used in play areas. There are some studies that show potential health effects connected with repeated exposure to the crumb rubber infill used in some sports fields. Until this matter is considered settled, it is best to choose other infill options, such as our popular Durafill. Overall, artificial grass is a low-maintenance playground ground cover option that cushions falls, reduces slipping and tripping hazards, and will last long after your children have outgrown the play structure. It has higher upfront costs than some other options, but can save significant amounts of water, time and money over its lifespan. 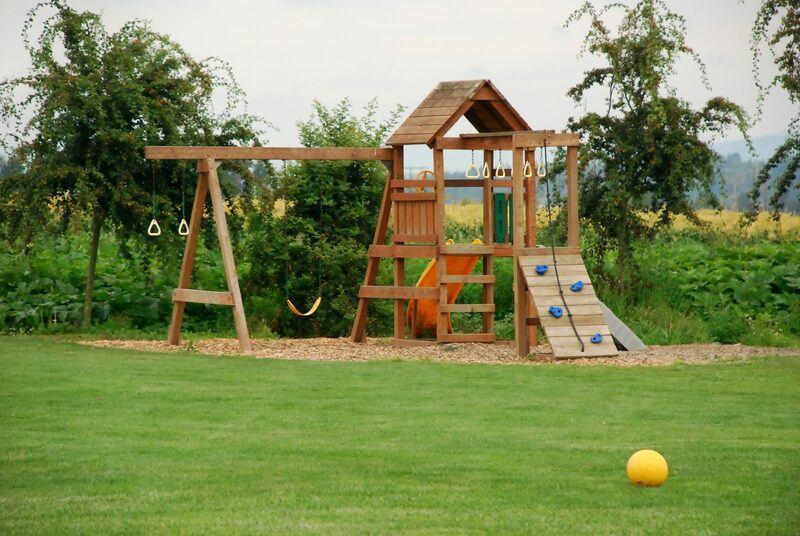 As an added bonus, if you remove the play structure after your children have outgrown it, you will still have a beautiful, functional lawn area that you can use for other purposes. Sand has long been the ground cover of choice for play areas, most likely due to its affordable cost and ability to absorb falls. It should be noted that shallow sand does not provide good protection when landing, so you will need to make sure to have several inches (ideally about one foot) of sand evenly spread across the area in order for it to be effective for this purpose. Because sand can shift over time, you will need to check the depth regularly and replenish areas that have become too shallow. Sand can scrape knees, and some can contain harmful substances that you would not want around your pets or children, but if you purchase sand that is specifically intended for play area use, it should be softer and safer than other types. If pets share this space, you may want to keep in mind that both cats and dogs often prefer using sandy areas as a restroom. One of the biggest downfalls of sand being used as a ground cover under a play structure is its ability to get inside socks, outside of play area borders and into your house. Sand is certainly an affordable option that will work in a playground setting, but it is also a messy one that may become annoying over time. If you like the idea of building sand castles or playing in the sand with your kids, but are not as keen on the potential mess, you might want to consider installing a sandbox as a smaller feature in your playground or creating a beach area in another section of your yard. Wood chips and mulch are generally more expensive than sand or pea gravel, but they also provide a superior visual appeal that will complement any type of landscaping. These options are available in a range of colors, which makes them even more appealing to homeowners who care about the look of their yard, but there are a few downfalls to consider. Both wood chips and mulch can hide hazards (like broken glass), be prone to mold and make a good habitat for insects (like fleas), which makes them less than ideal for a children’s play area. Both options can be swallowed by kids and present a choking hazard when used in areas frequented by young children. And, of course, any wood product comes with the potential for splinters; however, there are wood chips specifically made for playgrounds that are made in a way that reduces the chance of getting splinters. Mulch and wood chips tend to lose their color and texture over time and will require regular refreshing to stay looking their best. Additionally, most of the bags of bark or wood chips you will find at your local garden center or home improvement store are made with dyes that enhance the color. Therefore, if you choose this affordable option, be sure to look for all-natural products that do not have dyes or unnecessary chemicals. 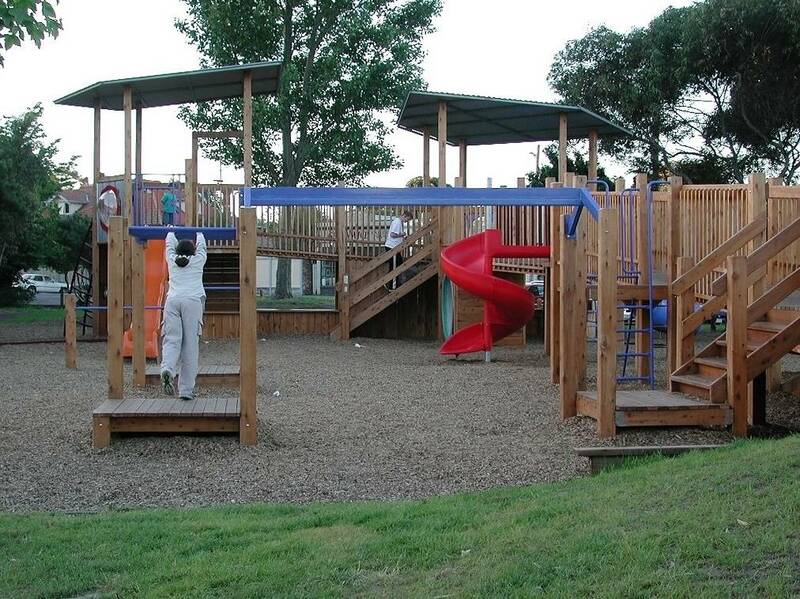 Engineered wood fiber (EWF) is a common material used in public playgrounds and is increasing in popularity for home use. This attractive, slip-resistant option provides a springy cushion for falls and is generally considered a better option than mulch or wood chips. It is made from wood, which means it will biodegrade over time and require replenishment. Since it is generally more expensive than wood chips, mulch, sand, pea gravel or natural grass, this may make it a less appealing option for some property owners. If you choose this option, make sure you purchase EWF that is made from virgin wood, since engineered fibers made from used wood may contain contaminants. Have you installed a play structure at your home or in a common area in your multi-family complex? If so, which playground surface did you select, and why?